What are the Advantages of Composite Hose? Home/Blog/What are the Advantages of Composite Hose? A composite hose a form of hosepipe available from Proflex Hose which made from a combination of materials. And can tailor to suit a number of functions, making this hose type particularly versatile and adaptable. Unlike other single-material hoses, composite hoses made from a range of materials bound together in one single tube. Based on the “mandrel-wrapped principle”, these hoses consist of a spiral of wire, which then has a layer or layers of a polymer, film or other material wrapped around it, and finally, a second wire spiral, tightly binding everything together. The two wire spirals provide the pressure resistance which hoses popular for and also keeps everything linked together under pressure. These wire screw can be composed of galvanised or stainless steels, aluminium, polymer-coated steel or even alloys like Linconel. The two spirals can even be different metals, although this is not normally necessary. The film component of the composite hose pipe can polypropylene, polyamide, polyester or other extra esoteric polymers, depending on your requirements. In this way, your hose can tailor to the fluid it will carry, the temperature, the pressure, and your mechanical requirements, for total versatility! One of the key strengths of composite hose pipe is adaptability and variety of capabilities which are possible in design. When ordering a composite hose, it is possible to completely customise the manufacture to suit your needs. Making sure that you get a hose that perfectly meets your needs – whatever they are! While steel piping and other metallic are at risk of erosion. The atmosphere or the fluids they carry, composite hose-pipe doesn’t have that problem. So, composed of non-corroding polymer sheeting, with an internal coil of stainless or coated steel. Your composite hose pipe will continue erosion and is perfect for carrying liquids like salt water or aromatic hydrocarbons. That could erosion another type of hose, causing it to fail. 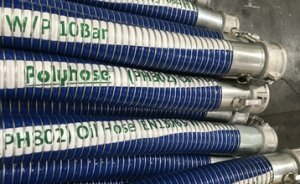 The final big advantage of the composite hose is that the hoses can be made completely to order, with completely bespoke designs available. Since ordering from an expert manufacturer such as Proflex Hose, your order can dictate every aspect of the hose, from the wire and polymer film chosen to the length of the hose, So, the bore of the tube, the pressure and temperature capability, the fittings attached, and any other aspects which may need to be modified!